On Friday June 12 O’Donnellan & Joyce will hold a large full day auction when a mix of private and investment properties will go under the hammer. The auction will be held in the Harbour Hotel, Galway. Registration for the morning session will start at 9am and the auction will commence at 10am. Registration for the afternoon session will start at 1.30pm and the auction will commence at 3pm. Together with a wonderful selection of family homes listed for sale on the day, there are many investment properties in various locations in Galway city and throughout the west of Ireland. Here are some of the investment properties going under the hammer on June 12. No 3 Bridgewater Court is a large three bedroom duplex townhouse located in the city centre. It is a close to the Claddagh, Jury's Hotel, and the Spanish Arch, and within walking distance of the city centre and Salthill. It is part of a secure development that has both stair and lift access. Presented in excellent condition, the property extends to 1,000sq ft and the BER is D1. Going into the auction room with an AMV of €125,000, this is great value for money. It is within walking distance of NUIG and UHG. No 5 Bridgewater Court is a lovely two bedroom duplex property extending to c650 sq ft with a BER of D2. It is located in the same block as No 3 and is presented in excellent condition. Going into the auction room with an AMV of €115,000, it is sure to attract a lot of interest because of its location and position. Open viewing takes place Thursdays and Saturdays. Number 3 is open from 2pm to 2.30pm, and No 5 is open from 2.30pm to 3pm. The solicitor with carriage of sale is Susan McLoughlin solicitor, 5 Mary Street, Galway, phone 091 567550. 21 The Plaza is a large two bedroom apartment superbly located just outside the city centre on the Headford Road, beside the long established area of Woodquay. The property is located beside Lidl and within easy reach of Galway Shopping Centre and Galway Retail Park. The property is close to all amenities and within walking distance of Eyre Square, Shop Street, NUIG, and UHG. This is an ideal investment property in a very convenient location. Presented in excellent condition, it extends to c650sq ft and has a D1 energy rating. Going into the auction room with an AMV of €130,000, this is very good value for a property in such a wonderful location. Open viewings takes place Thursdays and Saturdays 2pm to 3pm. Solicitor with carriage of sale is Eoin Armstrong, Hegarty & Armstrong Solicitors, Top Floor, Millennium House, Stephen Street, Sligo, phone 071 914 2684. O’Donnellan & Joyce is offering two four-bedroom end of terrace properties at Cul an Aith. These properties are being sold individually. Located in the centre of Barna and within walking distance of Barna Beach, Barna Woods, and Silverstrand and also from the local primary school. These are superb family homes in the ultimate location. The AMV is listed at €250,000 each. Open viewings take place Saturdays from 3.30pm to 4.30pm. Solicitor with carriage of sale is Temple Chambers, 3 Burlington Road, Dublin 3, phone (01 ) 2026400. 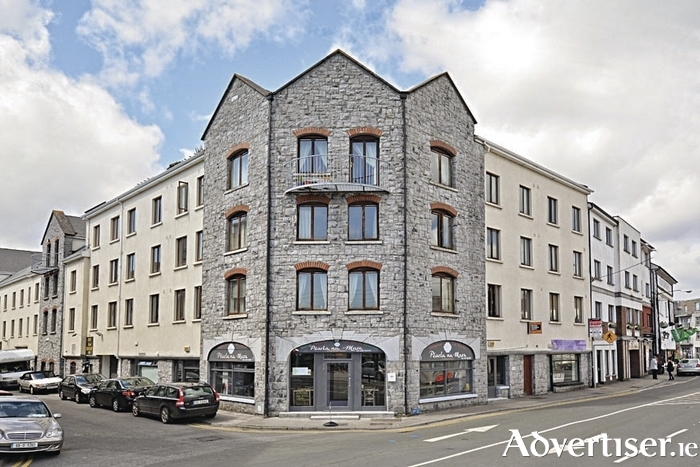 This spacious three bedroom apartment is located in Bride Street in the centre of Loughrea. Loughrea is a popular and busy town within easy commuting distance of Galway city. This property would be an ideal starter home or investment property. This apartment has an attractive AMV of €25,000. Open viewing takes place Tuesdays 4.15pm to 5pm. Solicitor with carriage of sale is Julie O’Sullivan, Lavelle solicitors, Saint James House, Adelaide Road, Dublin 2, phone (01 ) 6445800. For full details of all 60 properties contact the O’Donnellan & Joyce auction team at (091 ) 564212 or see www.odonnjoyce.com. Page generated in 0.1505 seconds.